The husband stayed home today because of flu. The little one is always happiest when both of us are within her reach....meaning, both at home. This is why Sunday is her favorite day. If she can't bug me, there's another one to bug. Today is a bit different though because Dad is sick so she couldn't play with him. Nevertheless, she's happy because she can see Dad anytime her little heart desires. The whole day, she's been really quiet...letting Dad get the rest that he needs. Every now and then, I'd catch her taking a peek just to get a glimpse of Dad. If he goes to the bathroom at the time she peeks, she gets worried asking where Dad is. When I took a shower, she stayed on the bed laying down beside Dad. Quietly watching him as he sleeps. When I came out of the shower that's what she was doing. I went to check my emails, she stayed on the bed with Dad. I had to come get her so she could go to bed herself. She tried to convince me to let her stay there. Of course I said no. 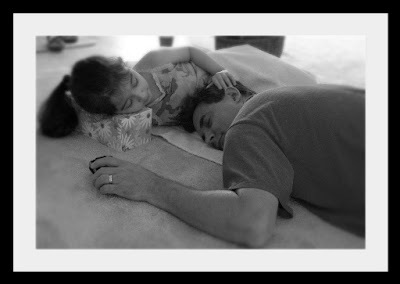 She settled with a long hug, a pat on his head, a kiss and her line: "I love you Daddy. Feel better tomorrow, ok?" So yeah...we have one sweet little girl here with us. A chatterbox alright but the sweetest chatterbox at that. sabi nun dr. form of hernia daw! lol! aw! that is a very sweet post. sarap talaga ang baby girl. super sweet ano! in short... hindi totoo... mas marami grammatical errors ko e di dapat genius ako! lol! Salamat king bisita at pangadi. e inda mag nerbyus yapa murin pero map namu atin kung kaluguran a miki anak a mekisabe king flight na at misiping lapa. So she should be fine. oh, she's so sweet! you and hubby are lucky and so far are doing a very good job raising a princess like her! -thank you for the comforting words sis, i'm not feeling any better yesterday as if my heart did sunk the whole day, kasi nga i could not help thinking about it... pero, i'll feel better soon. Wow! this is very sweet and so cute...............there is no words to discribe it..........father and daugther bonding time togetheri I think is just great! have a great day! Nakakatuwa tlga mga kids kht makulit. ur kid & my kid, they are the same. ako kpag may masakit ganyan sya maalaga dn sa akin at hindi nagungulit. evry now & then, he's checking me, hehehe! may consuelo n tayo! kaya kht mahirap i love being a mom! Naku, flu season n tlga! we just got oue flu vaccine shot yesterday though pricey ok n rin kesa nman magkasakit. ang dali ko pa nmang mahawa! Ikaw sis ingat ka. i hope your hubby feels better soon! I am so impressed by the way your daughter was brought up. Nothing is more soothing than the touch of those li'l hands. With a loving wife and daughter around him, he'll sure be feeling well soon. Btw, thank you for the visit and comment. I can feel your beautiful heart.